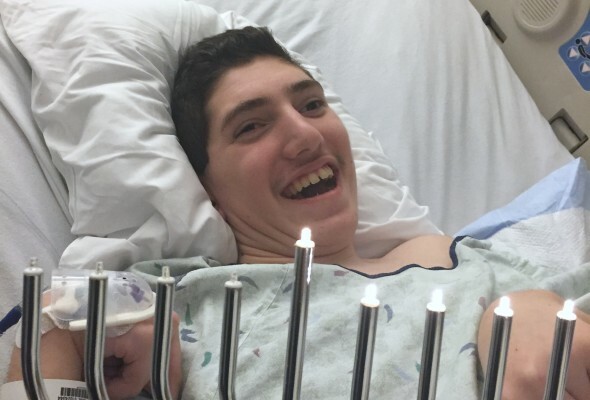 We’ve been told that Ethan has this uncanny ability to time his hospitalizations around holidays: Rosh Hashanah, Yom Kippur, Sukkot, Simchat Torah, Chanukah, Passover, Birthdays, and Mother’s Day. I guess the odds are that when you spend more than 300 days in the hospital over 2 ½ years’ time, you’re bound to be in-patient over some holidays. This week’s holiday of Hanukkah is no different. Ethan was diagnosed with a UTI on Tuesday morning, and by Tuesday afternoon, his bowels decided to take a siesta. We know all too well that when his bowels go to sleep, then we need to head down with him to CCHMC. It’s a phenomenon that we have lovingly diagnosed as “Quiet Bowel Syndrome,” and the prescription is complete bowel rest, time and patience. Fortunately, we are seeing a much quicker turnaround than we have seen with all of his other hospitalizations for the same issue. His systems have woken up and we have begun feeding him through his G-Tube and we are watching for his tolerance. If all goes well, Ethan will be discharged sooner rather than later. This Sunday is the 3rd annual Eighth Night for Ethan. A wonderful committee of great friends has worked tirelessly to put together a fundraising celebration for Ethan on the last night of Hanukkah. While our intention was to bring Ethan to this year’s event, we will have to wait and see if he is discharged from the hospital and if he’s strong enough to attend. Regardless, we will be there, and we look forward to seeing whoever is available to join us. We welcome you all, whether your traditions include Chanukah or not! Let’s light the last candles together, and thank God for the many miracles in our lives.